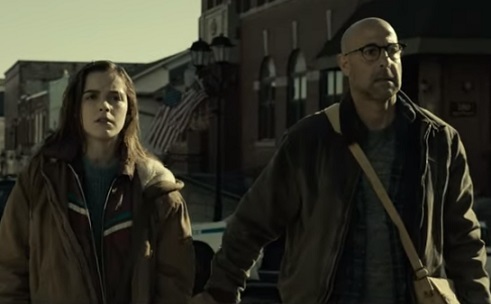 Netflix has released the trailer for its upcoming horror movie The Silence, based on the acclaimed novel of the same name by British writer Tim Lebbon. The film, from the director of Annabelle, John R. Leonetti, follows Ally Andrews (Kiernan Shipka), a deaf 16-year old teenager, and her family, as they seek refuge in a remote haven when terrifying creatures start hunting their human prey by sound. They soon discover they are not safe there, either, as a sinister cult are eager to exploit Ally’s heightened senses. The cast also includes Stanley Tucci, Miranda Otto, John Corbett, Kate Trotter and Kyle Breitkopf. “Some will fight the darkness. Some will become it” onscreen lines read throughout the trailer, which gives viewers a glimpse into the Andrews family’s quest of staying alive during the deadly attack by a lethal bat species called Vesps. They leave the city and meet a mysterious cult whose intentions are not good at all, judging by the scenes revealed in the promo. The Silence, which was described as mixing elements from A Quiet Place and Bird Box, will premiere on Netflix next month, on April 10.